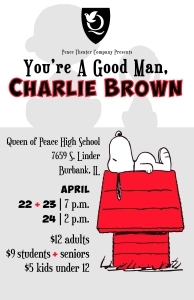 The Queen of Peace Theater Company will present You’re A Good Man, Charlie Brown a wonderful family friendly musical that captures the essence of Charlie Brown and the entire Peanuts gang. Performances will take place on April 22 and 23 at 7p.m and April 24 at 2pm. Tickets will be on sale at the door $12 for adults, $9 for seniors and students and $5 for kids under 12. A Catholic Dominicans of Sinsinawa college preparatory high school established in 1962, Queen of Peace is dedicated to the education and empowerment of young women in an environment that inspires academic excellence in a nurturing culture grounded in Dominican Values of Truth, Compassion, Justice, Partnership, and Community. Queen of Peace is one of only two all-girl high schools in America to partner with nationally-recognized Project Lead the Way (PLTW) to offer the STEM (Science, Technology, Engineering and Math) curriculum. www.queenofpeacehs.org.